According to The Register, a condition called “Laptop Computer Induced Erythema ab Igne”) is now causing concern amongst medical researchers. Erythema ab Igne is more commonly known as Toasted Skin Syndrome – the term used to describe the blotchy red areas that can appear on the skin after exposing it to heat for long periods. In this case it is caused by the sufferers using their laptop computers directly on their laps for a long periods of time. These blotches can get very itchy and they are undoubtedly ugly, but the main concern is that the discolouration may be permanent. Also, it is not clear if there may be other long term problems such as an increased risk of skin cancer as a result. There seems to be some fuss about it at the moment, but it is not a new problem, and we have been concerned about it for some time. Toasted skin syndrome is just one of a number of potential health issues that are caused by using laptops computers in this way. 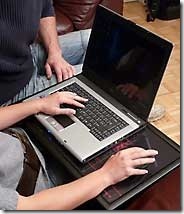 The obvious way to avoid the problem is to put some separation between yourself and the laptop, and I can think of no better way to do that than by making use of an eTray laptop tray. The eTray will protect you from the heat of the laptop and will also put you in the correct ergonomic position so that you avoid back and neck strain.